In August, the City of Brevard received a $90,000 grant from the Parks and Recreation Trust Fund (PARTF) to expand the Estatoe Greenway. Conserving Carolina wrote the grant to secure the funds. This was part of over $6.7 million in funding awarded to 27 local parks and recreation projects throughout North Carolina. Meant specifically for land acquisition, this grant will help the City expand the current greenway. The intent is to purchase tracts of land through which the greenway will pass, ultimately linking together important community landmarks. 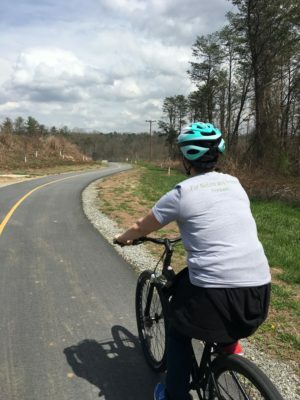 When completed, the Estatoe Greenway is planned to connect a number of significant community resources, destinations, and landmarks throughout Brevard. In its current state, the greenway runs 4.8 miles from Pisgah National Forest to McLean Street in Brevard. It begins in the Davidson River Campground in Pisgah and continues into the city – passing by recreation areas, the Transylvania County Hospital, St. Timothy Methodist Church and Brevard Middle School. The grant allows for the greenway to grow beyond McLean St. and into downtown Brevard. It will enter the vibrant Railroad Arts District and wind through downtown, then pass through the historic Rosenwald community to connect with the Mary C. Jenkins Community Center and Tannery Park. Having the greenway touch these important places in the Rosenwald community is “exciting on so many levels” says Rosenwald Community Liason Nicola Karesh. On the Estatoe Greenway’s new path, Nicola says that community members will have easier access to historical tours and garden club events, as well as new projects like the soon-to-be rebuilt community center, a new skate park, and historically significant art displays.